Right now I am at home – another day off – waiting for some gravel to be delivered for our front drive. Right now, you are reading this (well I hope somebody is, or will). You can see I am having trouble with tenses here, because your ‘now’ is not my ‘now’. I know you are not reading this now, because I haven’t published it. But you know you are reading it now. This all might seem a bit trivial and pointless, but stay with me for a bit. The notion I am circling around is the curious status of this concept of now. Let’s approach it another way: imagine yourself back at school, in a physics lesson. This may seem either an enticing or an entirely appalling prospect to you, but please indulge my little thought experiment. 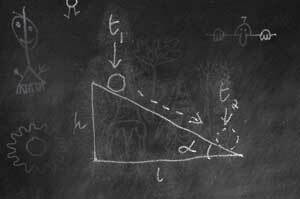 The teacher has chalked a diagram up on the blackboard (well, that was the cutting edge of presentation technology when I was at school). There’s the diagram up on the right. t1 and t2 obviously represent two instants of time for the ball, in its progress down the slope. Somehow you are managing to stay awake, just. But in your semi-stupor you find yourself putting up your hand. ‘Yes?’, says the teacher irritably, wondering how there could be any serious question to be asked so far, and expecting something entirely facetious. ‘Er – which one is now?’ you ask. The teacher could perhaps consider your question carefully, for the sake any deep conceptual problem concealed within it, but instead she wonders why she bothered to get up this morning. However there is a serious philosophical issue here – admittedly not in the physics curriculum, to be fair to the teacher. And the reason it’s not in the curriculum is that the concept of ‘now’ is alien to physics. ‘Now’ is entirely confined to our subjective perception of the world. 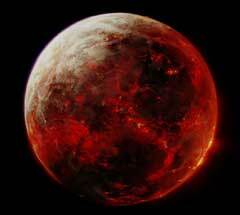 Think of the earth in its nascent state, a ball of molten lava and all that. Does it even make sense to imagine there was a ‘now’ then? We can say that this red-hot lava whirlpool formed before that one did – but we can’t say that either of them is forming now. Well of course not, in the obvious sense – it was four and a half billion years ago. But you could say that there was a time when your first day at school was ‘now’; and you can also say that there was a time when the execution of Marie Antoinette was ‘now’ – for somebody, that is, even perhaps for the unfortunate woman herself. But as for the formation of the earth – there was no one around for whom it could be a ‘now’. (Small green men excepted.) You’re thinking of it as a ‘now’, I expect, but that’s because in your imagined scenario you are in fact there, as some sort of implicit presence suspended in space, viewing the proceedings. It’s odd to try and visualise an exclusively objective world – one without a point of view – “The View from Nowhere” as the philosopher Thomas Nagel has put it; it’s the title of one of his books. In such a world there is no ‘now’, and therefore no past and no future, but only a ‘before’ and ‘after’ relative to any arbitrary point in time. And I was always struck by the way that T. S. Eliot, in Burnt Norton, from his Four Quartets, associates ‘time past and time future’ with the poetic and spiritual, and ‘time before and time after’ with the prosaic and mundane. So all this would seem to support a philosopher I remember reading a long time ago. I don’t remember who he was, and can no longer find the passage. But I remember the sentence “Our language has a tiresome bias in favour of time.” I think this man was from the old-school style of linguistic philosophy, which held that most philosophical problems can be resolved into confusions caused by our use of language – and so time concepts were just another example of this. But I don’t think this is at all adequate as an approach, Pirahã or no Pirahã. However my language works, I would still have a sense of the differing character of past events, which cannot be changed, and future events, which mostly cannot be known – and of course a present, a now, which is the defining division between them. I would be surprised if the experience of a Pirahã person did not include that. How about another attack on the problem – to make an analogy between the spatial and the temporal? The spatial equivalent of ‘now’ is ‘here’. And there doesn’t seem to be any perplexity about that. ‘Here’ is where I am, er, now. Oh dear. Maybe these aren’t so easy to separate out. Perhaps ‘here’ seems simpler because we each have our own particular ‘here’. It’s where our body is, and that’s easily seen by others. And we can change it at will. But we all share the same ‘now’, and there’s not a lot we can do to change that. There is, of course, the remote possibility of relativistic time travel. I could in some sense change my ‘now’ relative to yours – but when I come back to earth I am back in the same predicament – just one that differs slightly in degree. But do we all share the same ‘now’? Here’s a slightly more disturbing thought. I have made out that my own sense of ‘now’ is confined to my own private experience, and doesn’t exist in the world ‘out there’. And the same is true of you, of course. I can see and hear you, and I find from your behaviour and the things you say that you are experiencing the the same, contemporaneous events that I am. But it’s not your private experience, or your ‘now’ that I am seeing – only your body. And your body – including of course your brain – is very much a part of the world ‘out there’. It’s only your private experience which isn’t, and I can’t experience that, by definition. So how do I know that your ‘now’ is the same as mine? Do we each float around in our own isolated time bubbles? I think perhaps there is a solution of some sort to this. If your ‘now’ is different from mine, it must therefore be either before it or after it. Let’s suppose it’s an hour after. Then if my ‘now’ is at 4.30, yours is now at 5.30. But of course there’s a problem with the now that I have put in bold. It doesn’t refer to actual time, but to a sort of meta-time by which we mark out time itself. And how could this make sense? It’s rather like asking “how fast does time flow?” when there is no other secondary, or meta-time by which we could measure the ‘speed’ of normal time. So perhaps this last idea crumbles into nonsense. But I still believe that, in the notion of ‘now’ there is a deep problem, which is one aspect of the more general mystery of consciousness. Do you agree? Most don’t. But right now, the gravel is here, and is spread over the drive. So at least I’ve managed to do something more practical and down-to-earth today than write this post. And that’s a little bit of my past – or what is now my past – that I can be proud of. This entry was posted in Language, What are we, really? and tagged consciousness, language, philosophy, time. Bookmark the permalink. ← We are all Newtonians now – or are we?